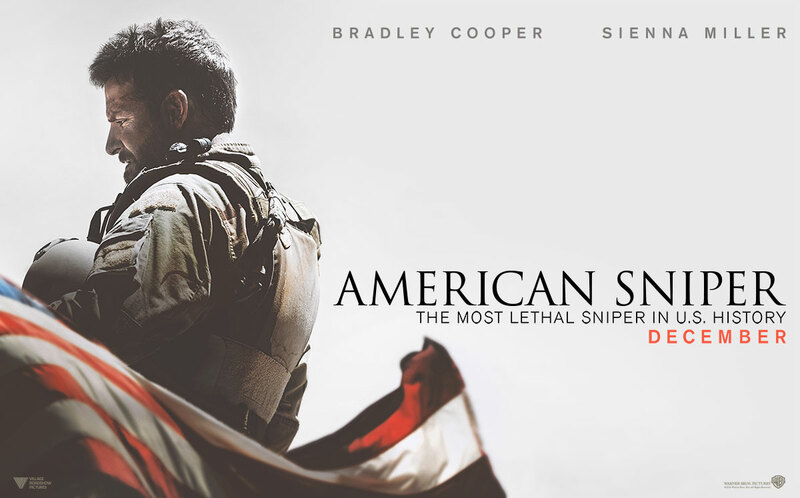 American Sniper – Did You See That One? Chris Kyle (Cooper) is a Navy SEAL and the most deadly sniper in U.S. military history. The heroics he displays on the battlefield come at a personal cost. Despite these costs, he continues to seek ways to save the men he serves with. Chris Kyle wrote his memoirs with the help of Scott McEwen and James Defelice (The Assassination of Jesse James by the Coward Robert Ford). His 160 confirmed kills made him the most deadly sniper in American military history. Along with his widow Taya and Jason Hall (Spread), the book was adapted into the screenplay for this movie. Clint Eastwood (Unforgiven) directed the film after both David O. Russell (Silver Linings Playbook) and Steven Spielberg (Jurassic Park) passed on the project. Bradley Cooper (American Hustle) stars in this film alongside Sienna Miller (Foxcatcher). Sam Jaeger (Catch and Release), Jake McDorman (Live Free or Die Hard), Luke Grimes (Taken 2), and Kyle Gallner (Dear White People) are also featured. The writers for this film had the difficult task of condensing Chris Kyle’s adult life and military career into a feature film. They had to pick and choose their way through his shooter logs and other military records to get one side of the story. For the other side they worked with his widow on understanding his home life and the personal toll his service took on him and his family. The end result is a story that really puts both sides of the story out there in equal parts. Like The Hurt Locker, this film allows all of the costs of war to be shown. The events chosen seem to encapsulate the bigger picture of Kyle’s military career. In addition, the choice of protagonists is a great driver for the intensity of the story. (I can’t say more about that without spoiling the film.) Overall this movie drives home a number of messages about duty and consequence. While the film only scratches the surface of his experiences, I think this tells a great story. Bradley Cooper underwent an extreme physical transformation to take on the role of this Navy SEAL. This physical transformation was accompanied by a great performance as the Texas native turned sniper. The emotions and the toll taken on his character are powerfully portrayed throughout the movie. His co-star Sienna Miller does an equally great job in this one. Her performance seems to drive home the experience a spouse might have seeing a loved one leave for war. She also brings out the emotions of a woman trying to reconnect with her husband. The pair have a great chemistry that plays nicely throughout the film. The rest of the cast all do a good job in this one. There are a handful of great moments featuring a number of actors including Sam Jaeger, Jake McDorman, Luke Grimes, and Kyle Gallner. Overall, the acting in this one is really good. The visuals and the sound design that went into making this movie are pretty great. The action scenes features intense visuals that really add to the emotional tone of the film. It’s always tough to see action scenes that get this close to the reality of violence in war. Thankfully this movie doesn’t overuse the imagery in telling the story. The editing and the camera work also add to the intense nature of the action scenes. In addition, the contrast is nicely made between Kyle’s time at home and his time in a war zone. The set design and costuming also add a lot in terms of authenticity. As a while, the production work on this film comes together nicely. This isn’t a movie about heroics as much as it’s a movie about a soldier doing his job. The cost of war is as important to this film as the battles are. If you’re a fan of Cooper, Miller, or any of the cast members; you should check this one out. I would also suggest this to anyone who enjoys the directing work of Clint Eastwood. This is also a good on for fans of war, action, or intense drama. I give this one 4.8 out of 5 stars. Thanks for checking it out. Definitely a great movie. Pingback: Wet Hot American Summer | Did You See That One? Pingback: Sully | Did You See That One?